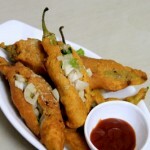 Mirchi bajji is a popular street side snack mostly found in the streets of south india or andhra regions. The mirapakaya bajji is an all time favorite evening snack and can be served with chutneys like green chilli chutney, coconut chutney , peanut chutney. Many streets in andhra are spotted with stalls making these chilli bajji which are a bit different from the northern mirch pakoda. 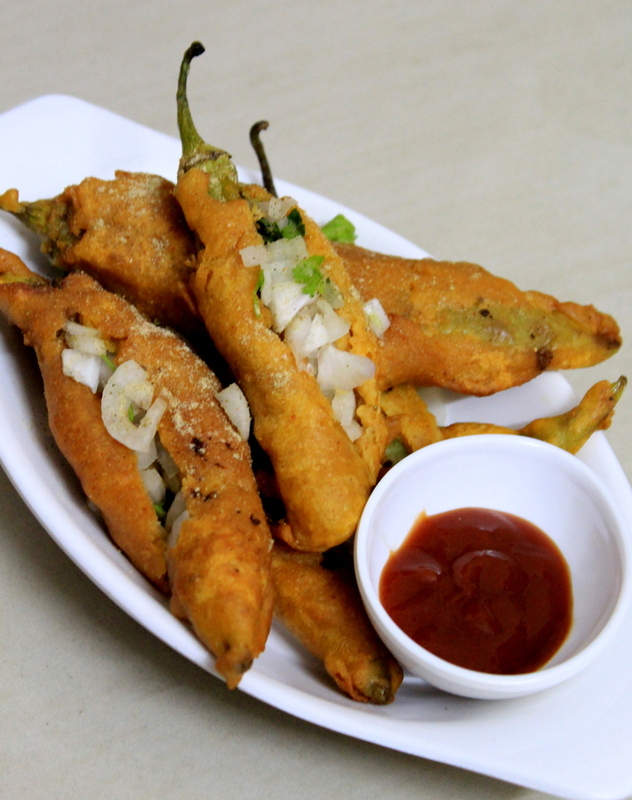 This snack is also called as milagai bajji in southern india. Here the mirchi bajji is made with a simple stuffing of tamarind pulp, salt and spices such as chaat masala powder and cumin seeds powder. The stuffing used here is a typical andhra stuffed masala. 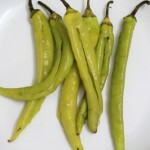 To make these mirchi bajji we need to use long thick chillies which are basically used in making few curries like mirchi ka salan. The most important part of the recipe is selecting or choosing of the green chillies. The bajji cannot be made with the help of small chillies. The stuffing in the chillies in an important part of the recipe which gives a flavor to the chillies… The stuffing used to make these bajjis can be made in various ways but, here I am sharing the typical way of making the stuffing which is commonly used in hyderabad streets or in andhra region. I shall be sharing different chutney recipes that can be accompanied with different snacks and also all the south indian style breakfast recipes. 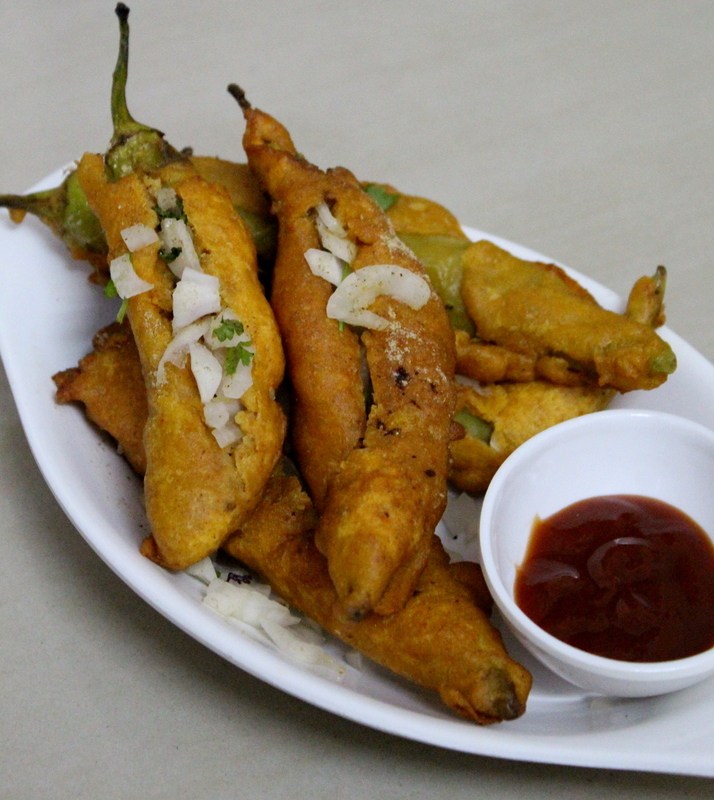 The mirchi bajji which I am posting today are very crisp and yet soft and gives a bite of the tangy tamarind pulp and the mirchi together which is a heavenly feeling. Do not be scared at the size of the chilli as the size scares us with its hot and spiciness. 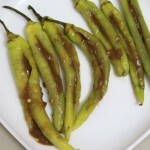 But, I have shown the technique in the recipe to get rid of the hot spicy flavor of the green chilli by blanching the chillies in hot water for minutes. 1.Soak two lemon size tamarind into some water for about 15 – 20 minutes(soak in such a way that the pieces are slightly dipped) or boil the tamarind with water to extract the pulp quickly. 2.Press the soaked tamarind and squeeze the pulp out and strain it out. 3.Discard the tamarind pieces and seeds. 4.Take the pulp and if the pulp obtained is not a thick paste then, cook the paste for few minutes so that the liquid gathers into a paste. 5.Cool the paste of tamarind and its ready to be used in stuffing. 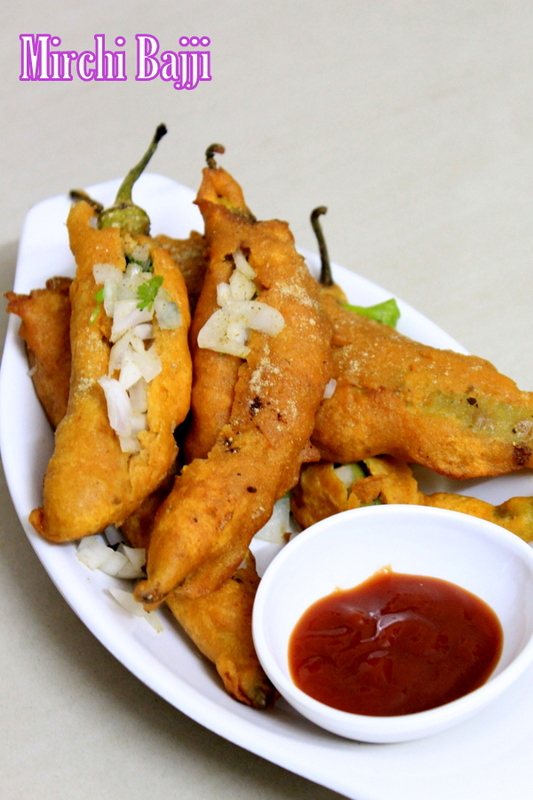 A popular street food snack recipe made using stuffed green chillies and deep fried in oil. In a vessel, add some water to boil, add green chillies and blanch them in water for about a minute. Doing so takes away the hot and spiciness of the chillies and the bajji can be eaten along with the chilli. After boiling slit the chilli vertically leaving the corner edges of the chilli. Do not slit the entire chilli, just slit vertically the centre part of the chilli. Remove the seeds from the chilli completely. In a bowl, add tamarind paste, salt as per taste, roasted cumin seeds powder, chaat masala powder and mix all the ingredients well. Take each chilli and stuff this paste into all the chillies and put them aside. In a bowl, add besan, rice flour, salt, baking soda, ajwain and mix all these. Into it add red chilli powder, turmeric powder, roasted coriander seeds powder, ginger garlic paste, oil and mix it well. 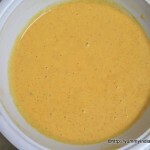 Add water and make a batter with a consistency neither too thick nor too liquid. The batter should be mixed well without any lumps in it. Heat oil in a wok for deep frying. Take each stuffed chilli, dip the stuffed chilli into the batter. Take the dipped chilli and drop it in oil. 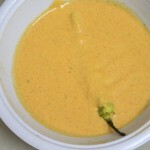 Similarly dip and drop the rest of the chillies too. Fry them on low to medium flame until they turn golden brown on all sides. Take them out on an absorbent paper. Take each fried chilli bajji, take a knife and give a small slit to the fried chilli. Stuff the slit part with very finely chopped onions and coriander leaves. Similarly garnish the rest of the fried chillies. Sprinkle chaat masala powder generously all over the mirchi bajji. Finally, serve them hot with any chutney!!! Yummy, chilli bajji with chutney is superb taste. 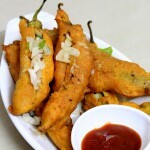 I like very much to eat chilli bajji on winter season. If ready tamarind paste is used, should this also be boiled or can be used directly?